Nothing but warmth and love filled ChezSoDo, an event venue in Lincoln, Nebraska, as the ceremony began. I was honored to play Pachelbel’s Canon on the piano as Stephanie walked gracefully down the aisle. A friend of Tristan and Stephanie, Allysa Diehl, perfectly officiated the ceremony. Having someone the couple knows officiate the ceremony is always fun to watch. I believe it adds a touch of familiarity to the ceremony. Once Stephanie and Tristan said “I do” they walked out to “Sign, Sealed and Delivered (I’m Your’s)” by Stevie Wonder. Shortly after the couple made their initial walk as husband and wife, the cocktail hour and meal followed. 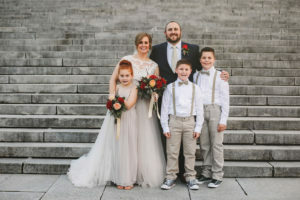 Good food and happy vibes filled the venue as the couple and their guests enjoyed a tasty dinner. The Taylor’s chose the most perfect first dance song – “Make you Feel my Love” by Adele. 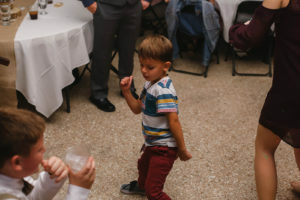 After the first dance, we picked up the pace with some family wedding jams and got everyone out on the dance floor! Laughter and great dance moves soon followed. 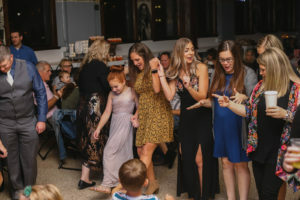 As the DJ, I thoroughly enjoy being a part of a couple’s special day and it was no different this time! By the end of the evening we slowed things down and I played “At Last” by Etta James to give the couple one more slow song to enjoy before the night was over. Thanks, Ben! Glad you enjoyed it!